This was a fun "present" from GR's First Reads. What a great way to introduce recipes and authors to readers everywhere. Not only did the recipes sound yummy, but the advice on life and love were eye-opening and helpful. You don't want to hurry through this book, but taste a bit here and there. Each morsel tempts you however, and you really can't put the book down for too long. Lois Winston has edited this cookbook in a very ingenious way. The writing advice each contributor has shared also adds to this special cookbook. So if it's baking you like or reading or writing, there's something here for everyone. Now I just hope there will be a sequel to this one. 105 authors and their recipes are fine, but how about another hundred to keep our minds and bodies well-fed! 105 writers were asked to submit a dessert recipe, advice on relationships, and writing advice.The common threads that pop up are: writers love cake, a sense of humor is important, and just finish already!My favorite piece of writing advice was on the importance of conflict driven plots: "Stick you main character in a tree and then throw rocks at her!" Great collection of recipesA great collection of recipes from all over. Each author has given a favorite recipe and relationship advice; I haven't read the love advice, but have read through the recipes and am going start making several of them. This is a fun cookbook, devoted only to dessert recipes--yum! 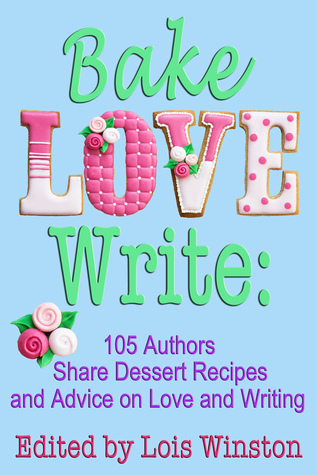 105 authors each contributed a recipe plus thoughts on the writing life...and love. Wonderful recipes, thought-provoking essays. A great project. I contributed my Aunt Martha's fabulous oatmeal cake. I took it to Thanksgiving dinner this last fall, and everyone ate the cake instead of the pumpkin pies! This book not only has yummy recipes but also thoughtful advice for writers and relationship advice. Something for everyone, right? I bought this book for a friend. I think it would make a great present for many occasions from birthdays to Christmas. Recipes are nice, but for me, the best part of this book is the advice for writers and being introduced to many new authors. Great book idea. Lois Winston Brenda Novak Debra Holland Lisa Verge Higgins Shelley Noble Caridad Piñeiro Diana Orgain Judy Penz Sheluk - Newsletter sign-up: MyAuthorBiz/ENewslettUSA Today bestselling author and ward-winner Lois Winston writes the critically acclaimed Anastasia Pollack Crafting Mystery series featuring magazine crafts editor and reluctant amateur sleuth Anastasia Pollack. Assault With a Deadly Glue Gun, the first book in the series, received starred reviews from both Publishers Weekly and Booklist. Kirkus Reviews dubbed it, “North Jersey’s more mature answer to Stephanie Plum.” Other books in the series includes Death By Killer Mop Doll, Revenge of the Crafty Corpse, Decoupage Can Be Deadly and the ebook only mini-mysteries Crewel Intentions, Mosaic Mayhem, and Patchwork Peril.Lois is also published in women’s fiction, romance, romantic suspense, children's chapter books, and non-fiction under her own name and her Emma Carlyle pen name. In addition, she’s a literary agent and an award-winning craft and needlework designer. She often draws much of her source material for both her characters and plots from her experiences in the crafts industry.Visit Lois and Emma at loiswinston and visit Anastasia at the Killer Crafts & Crafty Killers blog, anastasiapollack. Follow everyone on Twitter: twitter/Anasleuth.